For such small towns, Southern Shores and Duck, NC, restaurants have some pretty sophisticated dining options. Whether you want pizza delivery or upscale cuisine matched with a Wine Spectator award-winning wine list, you’ll find what you’re looking for. Most Duck, NC, restaurants, like so many of the Outer Banks restaurants, stick to American fare, with an emphasis on seafood. That doesn’t mean there aren’t creative chefs in Duck, NC; you’ll find some very innovative preparations of seafood, meats, fresh produce and traditional ingredients. Southern Shores restaurants include a couple of chains (ever heard of a little place called Starbucks? ), a great pizza place and a wonderful gourmet foods market/cafe. Duck, NC, restaurants can boast of three of the top food and wine destinations on the Outer Banks. You can sip coffee in a front porch rocker, have a romantic dinner with a sound view, savor wine under a canopy of live oaks, eat al fresco while listening to jazz, catch sports on a bar TV, grab a slice of pizza, lick an ice cream while feeding ducks or take the whole family out for a seafood dinner. In the summer, when there are way more people than there are seats at Duck, NC, restaurants, you may want to eat out early or late or make a reservation (where possible). The least crowded nights at the restaurants in Duck and Southern Shores are, maybe surprisingly, Friday and Saturday nights. That’s because of scheduled arrivals and departures at the vacation rental companies. Tuesday, Wednesday and Thursday are typically the busiest nights in the summer, local restaurateurs say. In the off-season, eating out in Duck, NC, is much more relaxed and accessible. Some restaurants close in the dead of winter, but there is always something open. Several Southern Shores and Duck, NC, restaurants are now staying open year round. Both towns have full ABC permits, so you can order beer, wine or liquor at restaurants that have those options. Duck Pizza Company's menu features a wide selection of creative pizza combinations with plenty of varieties to choose from. Featuring all fresh ingredients, you can also create your own pizzas or choose from subs, calzones, stromboli, salads or wings. They offer three sizes of pizza — small, large and their extra large one that's really huge at 18" and 12 slices — and make the crust fresh daily. Gluten-free and vegan menu options are available. Eat in, take out or take advantage of free delivery to southern Pine Island, Duck and Southern Shores. Duck Pizza is open for lunch and dinner daily in season. The Blue Point established Duck as an Outer Banks dining destination when it opened in 1989 and has since put the tiny town on the foodie map. The restaurant is lively and offers fantastic views of the Currituck Sound. The menus are creative, upscale, Southern and coastal, changing seasonally to reflect the fresh local and regional ingredients that are available. The dinner menu offers salads, soups, starters and entrees of seafood, beef, pork, duck and pasta. Lunch is a civilized mix of salads, sandwiches and entrees with an emphasis on quality dining, even if it is only lunch. The wine list and other bar offerings are extensive and well thought out and can be enjoyed in summer at the outdoor bar and lawn as the sun sets. Lunch and dinner are served daily year round (no lunch on Mondays during the in-season, and no lunch or dinner on Mondays in the off-season). Reservations are accepted online or by phone. Take a load off and let ClamBake OBX do some of the work of feeding your family! They'll bring the fun and excitement of an old-fashioned clam bake right to your front door, or you can choose from 14 other menus with their in-house chef services. 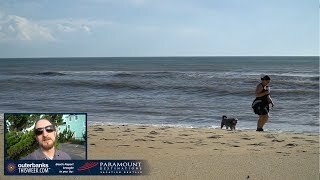 ClamBake OBX serves areas from Corolla to Hatteras Island, and they will come to your house and do all the work so you can relax and enjoy your vacation. A clam bake includes lobster (optional), crab legs, shrimp, clams, mussels, corn on the cob, red potatoes, pearl onions and smoked sausage. All of their seafood is fresh, and most of it is locally caught for the best Outer Banks flavor. They also offer several dinner entrees featuring prime choice USDA meats including pork, beef and chicken with all the trimmings. ClamBake OBX will set up everything buffet style, and all you have to do is serve your own beverages. They can serve six to 600 guests and have menus that are child friendly, and they will even clean up afterward! They specialize in cooking onsite to keep a quality control on the event. Note: They also do grocery delivery, stocking the house before you arrive, so you can walk in and start your vacation the right way. Opened in 2006 as a gourmet market, Coastal Provisions Oyster Bar & Wine Bar Café now serves full-service lunch and dinner featuring their award-winning cuisine, full bar and a world-class oyster bar with one of the largest selections on the East Coast. A contemporary menu of top quality local ingredients and fresh Outer Banks catch expertly prepared and served in an unpretentious atmosphere has garnered this place wide acclaim. You'll also find great small plates, wine pairings, beer flights and cocktails with daily specials for lunch and dinner. Lunch begins at 11 a.m. with dinner starting at 5 p.m. Reservations are suggested for dinner and for larger parties. Indoor and patio seating are available. The dining room can easily accommodate larger parties from 10 to 30. Call ahead for availability. A good place to gather your friends, Fishbones has a friendly, laid-back atmosphere that will have you lingering over a beer long after you’ve finished eating. Starters will get you going with favorites such as wings, calamari and coconut shrimp. Then you can choose from amazing conch or clam chowders, salads, sandwiches, burgers, fried seafood baskets, seafood from the raw and steam bars, daily specials or entrees including fish, shellfish, beef, pasta and chicken. Fishbones is open for lunch and dinner daily. Call ahead for take out. The bar area has six TVs running for the people who are hanging out. The Pizza Stop bakes fresh, hand tossed, authentic New York–style pizzas in their own stone ovens. All dough, sauces and most of the dressings are made in house. Choose from a variety of specialty pies or create one of your own with fresh, often organic, veggies and toppings. They also serve subs, pasta dishes, salad, wine and beer. You can eat in, take out or get free delivery in Northern Kill Devil Hills, Kitty Hawk, Southern Shores and the Town of Duck. Place your order by calling in or online at pizzastopobx.com. Pizzazz is a pizza favorite on the Outer Banks. They’ve been around since 1986 because they make consistently great pizza with generous toppings and the service is friendly. Choose from gourmet menu creations or stick with the traditional. Pizzazz also makes hot subs, salads and wings. You can eat in for lunch or dinner or have your pizza delivered. Call for off-season hours. And, if you're driving to the Outer Banks from the north, check out their location in Grandy on the Currituck mainland. Red Sky is an inviting cafe with a creative menu of contemporary coastal cuisine. Chef Wes Stepp and his team turn out some incredible fare, including filet mignon, crispy duck and seafood. The kitchen prepares seafood, pasta and chicken creations plus sandwiches, salads, soups, appetizers and desserts. The daily specials are always worth trying. Top-quality, flavor-rich ingredients round out all the offerings, and the sides are usually as show stopping as the featured dish. In season Red Sky opens at 11 a.m. for lunch and dinner on the weekends and at 11:30 a.m. on Mondays through Fridays, and it has a full bar with an exciting wine list. For those who want to stay on their nutritional plan while on vacation, Chef Wes has combined his passion for fitness with his passion for great food; his Tastefully Fit menu offers delicious, healthy meals cooked at your vacation home or available in the restaurant. Not only does his menu reflect many Tastefully Fit dishes, but Chef Wes has also begun doing Tastefully Fit meal prep for customers. You can also order full meals to go or hire their Chefs On Call service, and they'll cook for you at your place. Red Sky is also one of the popular choices for wedding caterers serving the entire Outer Banks, including Carova. This restaurant comes by its name honestly. It’s on the Currituck Sound, perfectly oriented to those nightly sunset shows. To better enjoy the setting sun, you can dine outdoors on the huge waterfront deck. Sunset Grille has a Caribbean theme: Jimmy Buffett, tiki lights, colorful decor, island drinks and fare … you get the idea. It comes together as casual and fun and very family oriented. The lunch and dinner menus focus on seafood with many Key West- and Caribbean-inspired dishes. Raw and steamed seafood, salads, chowders, a variety of appetizers, lunch entrees, burgers, sandwiches and dinner entrees of seafood, beef, chicken, pasta and ribs are available on the menu, along with tempting desserts, and this year they have a daily breakfast menu. Sushi is served nightly. Sunset is open for breakfast, lunch and dinner and later for the nightlife crowd. There is a DJ or karaoke Monday through Friday nights in season. Sweet T’s Coffee Beer & Wine in Duck is the perfect casual spot to hang out. As a full-service coffee shop it offers many of the coffee and espresso drinks you love, plus pastries, muffins, bagels and other treats. A large selection of craft beer and wine makes it simple to enjoy the tree-shaded deck with a draft beer or glass of wine. You can also mix-and-match a six pack or grab a bottle of wine to go. Sweet T’s serves light snacks and features a selection of wraps and salads from The Salad Bowl. Live music is offered occasionally in the late afternoons and evenings, and wine and beer tastings are held regularly. Free WiFi. In-season hours are 7 a.m. to 9 p.m. Monday through Friday and 7 a.m. to 6 p.m. Saturday and Sunday. The Paper Canoe features fresh, simple food in a polished, casual atmosphere with a stunning waterfront view. Entrees and Old World wood-oven pizzas are prepared with local seafood and locally grown vegetables. An ever-changing chalkboard menu features daily selections like homemade pasta, locally caught seafood and rustic wood-oven specialties. Ten craft beers on tap and an extensive wine list will have you lingering well after dinner. The Paper Canoe is on the Currituck Sound on the north end of Duck, across from the Sanderling Inn. It's open for dinner daily. Reservations are recommended.